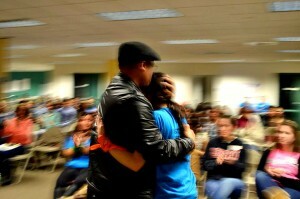 Katherine Asuncion hugs her father at SIM Camp, an annual two-day event for leaders of the undocumented immigrant movement. Photo courtesy of Conrado Santos. At first glance, June 15, 2012 looked like the day young undocumented immigrants across the country had been waiting for. The Boston Globe reported young people in Boston crying with joy at the news that President Obama had implemented a policy that would allow thousands of young undocumented immigrants to gain temporary legal status, obtain drivers licenses and work legally. Deferred Action for Childhood Arrivals, or DACA, would be available to those under 30 without a criminal record who had arrived in the U.S. before age 16 and been in the country for at least five consecutive years. The policy would in turn make it difficult for Massachusetts to justify denying in-state tuition at state colleges and universities to people with temporary legal status. In August 2012, Gov. Deval Patrick would extend in-state tuition benefits to DACA recipients. But on June 16, only a day after the reports of tears of joy, the reality of DACA began to set in. Conrado Santos, campaigns consultant for the Student Immigrant Movement, a Boston-based immigrant rights group, said the impact of that policy change can be summed up in a photograph. Of five students depicted in the Boston Globe article celebrating DACA, only two of them were actually eligible for deferred action. “We were like ‘what about everybody else?’” he said. While DACA has dramatically changed many young immigrants’ lives in Massachusetts for the better and made a college education possible to many who never thought they would be able to afford it, what stands out the most almost a year later is how many people were left out, and the reality that a college education is still just a dream for many undocumented immigrants in the Commonwealth. Massachusetts is a state known for innovative and forward-thinking policy and for being on the cutting edge of education. In one of the most recent examples, Boston Mayor Tom Menino is partnering with edX to bring online Harvard and MIT courses to Boston’s community centers. On the issue of tuition equity for undocumented immigrants, however, the state is lagging far behind. Fourteen states across the political spectrum currently have tuition equity laws that extend in-state tuition to anyone who has attended a state high school and has a taxpayer identification number. A similar tuition equity bill has been stalled in the Massachusetts legislature for years. An estimated 14,285 undocumented immigrants under 18 live in Massachusetts, and with in-state tuition fees typically a third to half the amount of out-of-state tuition, a college education is simply out of reach for a small but important portion of the state’s youth. The effects of this are seen not only in the post-high-school opportunities available to undocumented youth, but also in higher high-school dropout rates among students who don’t see a future for themselves. The Pew Hispanic Center has reported that 40 percent of undocumented immigrants ages 18-24 have not completed high school. Katherine Adam, communications director for State Senator Sonia Chang-Diaz, chief sponsor of the Massachusetts tuition equity bill, says these elevated high-school dropout rates place a larger burden on the state. A study from the Rennie Center for Education Research and Policy found that the average high-school non-graduate in Massachusetts costs the state nearly $122,000 over the course of his or her lifetime. In comparison, the average high-school graduate will contribute $344,700 in taxes (undocumented immigrants pay payroll taxes, Adam explains, but rarely enjoy the benefits they help pay for). Meanwhile, a study by the Massachusetts Taxpayers Foundation has shown that extending in-state tuition to undocumented youth would generate $7 million in additional revenue for the state’s higher education system. And now, DACA is providing a glimpse of what providing in-state tuition to undocumented youth could look like – and it’s anything but complete mayhem. Mendes wants to work in health care administration, and last fall he enrolled at MassBay Community College to study business administration. Because he was undocumented when he enrolled, he had to pay out-of-state tuition, and so he planned to take classes part-time and continue working his factory job. Out-of-state tuition at MassBay is $380 per credit. Mendes was eligible for DACA, however, and last fall he applied and was granted temporary legal status. This also meant he was eligible for in-state tuition. “A huge load was taken off my back,” he said. He became a full-time student and started paying the in-state rate of $174 per credit. Mendes, like other undocumented students and DACA recipients, is not eligible for any financial aid. DACA also enabled him to get a work permit, and he’s now working at Starbucks, what he calls a “normal teenage job.” He hasn’t gotten his driver’s license yet, but has plans to get his permit so he can start practicing for the driving test. Until then, a friend drives him the 30 minutes to school in the morning, and his mother picks him up at the end of the day. As thrilled as Mendes is at the new opportunities available to him, he is aware that his permit is only temporary and that many others, members of his family included, are being left behind. “It’s a feeling of happiness, but also to give back, to say this is only temporary. Everyone who’s received DACA grew up here, they feel American in a sense, but it’s bittersweet at the same time,” he said. Shannon Erwin, state policy director for the Massachusetts Immigrant and Refugee Advocacy Coalition, says that DACA is a start, but many are automatically disqualified for having left the country, if only for a day, during the past five years. Additionally, she says the number of those who are eligible is going to decrease as years pass. A relatively small number of the people estimated to be eligible for deferred action in the state – 17,000 to 20,000 – have actually applied. Based on the number who have applied nationally, Erwin estimates less than 9,568 of those applicants are from Massachusetts. The reasons for this are numerous. Some may be waiting for federal immigration reform, Erwin says, and others may feel it’s too risky to identify themselves as undocumented. She says they fear the information they put on their DACA application would be used to deport them. Applying for DACA is a complicated and expensive process. It costs $465 just to apply, and applicants often need to hire a lawyer, adding to the costs. Enrique Ramirez, a 19-year-old freshman at Harvard University, says his mother paid $3,000, including lawyer fees, for he and his two siblings to apply for DACA . It can also be difficult to provide proof that one has been in the country for five consecutive years, he said. Ramirez currently serves as a tutor through Harvard’s College Access Program, a subset of Act on a Dream, a group for undocumented immigrants at the university. The program pairs mentors with local undocumented high-school students to educate them about available programs, like DACA. The Student Immigrant Movement, or SIM, is also helping students navigate the process. After DACA was implemented, SIM hosted seven clinics in and around Boston for undocumented youth who qualified. The group brought in lawyers who worked pro bono to help the students apply for the program. Turnout was impressive, and applicants saved thousands of dollars in legal fees. Help of any kind is welcome in Massachusetts, a state Adam describes as “stubbornly anti-immigrant.” She says Chang-Diaz’s office is often left playing defense by trying to block anti-immigrant amendments rather than advancing pro-immigrant legislation. Every year she’s been in office, Chang-Diaz has filed the in-state tuition bill, which would grant in-state tuition to any undocumented immigrant who attended a Massachusetts high school for at least three years. But it hasn’t made it through the complex legislative process. Adam says the state will make a choice whether to offer undocumented students in-state tuition. But, she says, it’s also making an important, and problematic, choice if it decides not to offer educational opportunities to these students. “We’re creating a generation of people who don’t have the skills to fill these jobs in Massachusetts, who we aren’t empowering to achieve their dreams and the shared goals we have in Massachusetts, and we’re choosing not to live up to one of the fundamental values of our state, which is that we value education for everyone,” she says. The problem with not offering in-state tuition to a group of people, according to Erwin and Adam, is that a group of people ends up simply not going to college. The Pew Hispanic Center has shown undocumented immigrants attend college at drastically lower rates than legal residents. Among undocumented high school graduates ages 18-24, 49 percent are in college or have attended college. Among legal immigrants or U.S. born residents, this number jumps to 76 and 71 percent, respectively. A study done by the Massachusetts Taxpayers Foundation has found that, using estimates that 40 percent of Massachusetts’ undocumented graduating students would enroll in the state higher education system each year, this number of students could be accommodated by the 29 campuses at virtually no additional cost. What’s more, the study estimates that by the fourth year of the implementation of a tuition equity bill, the state would be taking in additional tuition revenues between $6.4 million and $7.4 million. The number of students in question is relatively small. Based on estimates from the Urban Institute, 65,000 undocumented immigrants graduate from high school each year in the United States, about 910 of them in Massachusetts. The Massachusetts Taxpayers Foundation estimates that between 315 and 365 undocumented students graduating from high school in Massachusetts each year would enroll in one of the state’s colleges or universities. Some graduates wouldn’t choose to go to college, others couldn’t afford it, and some wouldn’t meet the legislation’s eligibility criteria. While Bunker Hill appears to be embracing the new students, some colleges have been slow to catch on to the change in policy. Samuel Tsoi, program coordinator at the Massachusetts Office for Refugees and Immigrants says there’s not enough emphasis on training; he’s seen colleges wrongfully deny people in-state tuition rates. SIM leaders have been working to educate colleges by walking in and asking to enroll, explaining their status, and proving to the administration that they are eligible to pay in-state tuition. 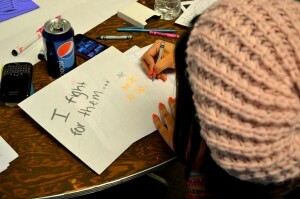 They have also been working to use their own personal narratives to inform people on the issue. Adam has seen the power of the individual narrative to sway policymakers. At the state Committee on Higher Education hearing two years ago, she said, a young undocumented immigrant testified and told her “story of self,” one of the most important weapons in undocumented students’ fight for equal rights. A businessman at the hearing was so moved by the story that he stood up and declared that he had changed his mind on the issue. SIM leaders take a break from training the new generation of leaders at SIM Camp. Photo courtesy of Conrado Santos. One Saturday this March, enthusiastic signs, hand-written with markers, led from a busy street to the second floor of a nondescript office building in Dorchester, where SIM Camp, an annual two-day event to train the new generation of immigration leaders, was kicking off. A roomful of immigrant students, parents and allies from around the state as well as Rhode Island, Connecticut and Maine, sat in front of a stage where SIM leaders told their own stories and gave presentations about how to use personal narrative to engage those around them in the fight for immigration reform. Conrado Santos took the stage and explained that he came to the U.S. from Brazil with his parents when he was 13. During his sophomore and junior years at Somerville High School he started to realize what it meant to be undocumented and saw little hope for his future. He attended his first SIM meeting in 2006 and found his calling. He’s been with the group ever since and on staff for the past year and a half. Santos’ main focus has been in-state tuition. He says it’s the issue at the heart of young undocumented immigrants’ fight for reform. “Living here undocumented so many doors are closed, but there’s this big idea in America about education being a path to growth. It buys into the American Dream and all of that, but it’s also a symbolic victory of students’ acceptance into public spaces,” he said. Undocumented immigrants are defined by others every day, in ways over which they have no control. At SIM Camp, Santos hesitantly uttered the word “alien” from the stage. He asked the students in front of him to raise their hands if they had ever felt like an alien, and if it had ever made them mad. To the few in the room who did not raise their hands, he said he didn’t believe them. The word that had the power to change Santo’s energetic and powerful voice to a whisper and to make a roomful of leaders squirm in their seats is tossed around by immigration opposition groups every day. Jessica Vaughan of the Center for Immigration Studies doesn’t hesitate when she says illegal aliens represent a cost to our society. She says that while people who have qualified for DACA have been granted an unusual status, they have not been admitted as legal residents. “My sense is it’s still important to recognize that there’s a cost to colleges for the in-state tuition. Taxpayers are subsidizing their tuition,” she said. To Senator Bruce Tarr, who has filed a bill that would prohibit Governor Patrick from granting in-state tuition to undocumented immigrations without a vote in both branches of the state government, the word equity is a misnomer. He says the tuition-equity bill is unfair to those who are in the country legally. Tarr also points out that state colleges are subsidized by taxpayers, and that in-state tuition rates represent an extraordinary benefit. As for the argument that undocumented students were brought by their parents and didn’t break the law themselves, he says the state looks at parent status to determine financial aid, so this shouldn’t be any different. Photo courtesy of Conrado Santos. One thing all agree on is that immigration reform is essential and could solve some of the problems currently stalling on the state level. “Until the fed government acts, the states are going to be left improvising solutions to a national problem,” says Tarr. He, like others, is cautiously optimistic that reform will pass this year. Even so, the in-state tuition bill may continue to be necessary, because there will always be undocumented people living in the Commonwealth. Erwin says that while only the federal government can give an immigrant legal status, state policies have a huge effect on people’s lives. “All states can do is make policies that either integrate people or make their lives harder. States like Arizona have chosen to make their lives harder. States like New York have made it easier to integrate people so their community is stronger. We need to have state laws in place that respect them as members of our community,” she said. The challenge for those fighting for the in-state tuition bill in Massachusetts is to show legislators that immigration is an issue people care about and that immigrants are a politically powerful group. Adam says those who are involved in the issue non-legislatively, like some members of SIM and other advocacy groups, need to make calls and visits to the legislators to voice their concerns. The bill has been assigned to the higher education committee, which will hold immigration hearings at the end of May. From there it will either go to the full house or the full senate to continue through the process, or, if it’s sent to study, no more work will be done on it during this legislative session. Santos, for his part, sees more energy surrounding the issue since the passage of DACA, and is optimistic about the future of the in-state tuition debate in Massachusetts. He wants to see legislation pass that will extend benefits to all of the 11 million undocumented immigrations across the country. 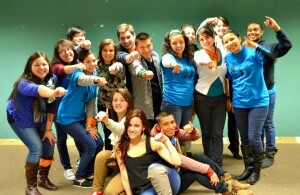 SIM has shifted their political focus from young “dreamers” to the entire undocumented community. Their current campaign, called “11 Million Dreams,” pushes for more community building and inclusion. Santos hopes to see his hard work pay off with the passage of immigration reform. “Some days you believe, some days you don’t,” he says.